Have you ever been to a Waffle House before? It’s basically got the best waffles you’ll ever have. Now I know everyone says that…they come up with a fantastic recipe – and no doubt it’s fantastic – and tout it as the be-all end-all of waffles. This wouldn’t be blogging if you didn’t claim something you made was the best, right? Well guys, I’m here to serve you up a little slice of my own humble pie: I have never, ever made a waffle that’s as good as Waffle House. And if you don’t believe me, ask my husband. And you know what? I’m OK with that – having the best waffles in the universe seems like it may just be a pretty high-pressure job. That high pressure waffle thing just isn’t my thing, but you know what is? Making waffles that my husband likes almost as much as Waffle House. So once upon a time, many moons ago, my family and I would vacation in Albuquerque, New Mexico. It was only a 5 hour drive from our home in Lubbock and offered beautiful views of mountains, great New Mexican food, and a short trip to Santa Fe for some outlet shopping. To this day Albuquerque holds a special place in my heart. But you know what else we did there? We stayed in a hotel that was right next door to a Waffle House. If only I’d known the glory of the Waffle House Waffle at that time, then I think I would have life figured out. Alas it took me marrying Nate to actually visit a Waffle House in my adult years and to see, firsthand, the glory that is THE waffle. It’s crunchy and creamy, sweet and buttery and all around amazing. Coupled with some eggs and sausage and we had ourselves full for the entire rest of the day. And the best part? Besides the waffle? The people who work there. We went to a Waffle House in Little Rock last Christmas and I came THISCLOSE to walking behind the counter and hugging the guy that was rattling off orders in secret code, scrambling eggs, flipping omelets and pulling our waffles from the irons in simultaneous harmony. It would have shocked the hell out him, but hey – I was on vacation, I was back in the South, and I just felt the urge. That’s life, right? The final part to this story – well, the final part for now – is the fact that Nate and I found a Waffle House in Aurora by the airport when we were on our way to Dallas. We ate there, loved it, got on the plane, and then proceeded to realize how chock-full Texas is with Waffle Houses. He threatened offered to take us there for every meal, but alas I felt it would be better for the baby to perhaps have some more nutritionally sound meals. Oh, and Tex-Mex. Lots of Tex-Mex. I agree with you…Waffle House has the best waffles! I haven’t had one in a good 15 years and now I’m wondering how in the heck I’m going to get myself to a WH when I live way over here in Seattle. I agree with you! Waffle houses are delicious. You can order practically anything from them! I love how many choices there are on the menu. Thank you for writing about waffle houses and reminding me to go again soon! I am craving waffles now. Wish we had a Waffle House in Utah! Waffle house was always a vacation staple for my family too- our favorite one was somewhere in Mississippi…gotta love getting the “Mornin y’all!” from the waiters as soon as you walk in the door! ps. There’s a waffle house just north of Denver (right off of I-25 at 84th St.) too! I’ve only been to a Waffle House once, in Florida, after a 24 hour drive from Indiana to Florida for Spring Break. Our waiter was decidedly not awesome, and even made fun of my (vegetarian) friend for ordering “just cheese and eggs” (no meat). It still makes me chuckle to this day. But, based on your story, maybe I need to give them a 2nd try! I’ve been to too many waffle houses in the wee hours of the morning on the multiple day trips in the car from NY to FL and back that we’ve taken. Delicious waffles, sketchy crowd at 4am, not gonna lie. This made me want a waffle so bad! I haven’t had one in wayyy too long! And I woke up thinking “Waffle House?! 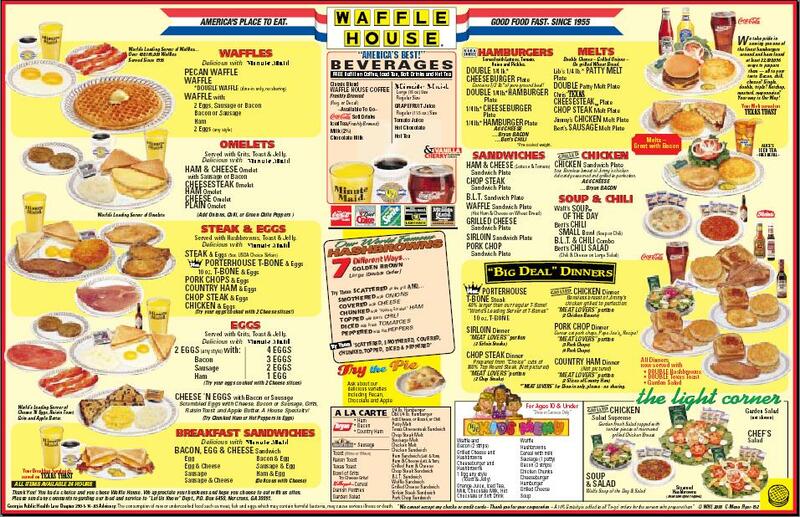 Where did I get Waffle House from….” and then I really wanted a waffle.